Deck Heating in Edmonton | J.W. Brian Mechanical. Plumbing and Heating. Get a few extra months of deck usage with a convenient deck heater. Why not extend your deck’s use from 4 months to 6-7 months per year? Not only will they keep you toasty warm during those chilly spring and fall months, they can add to a decks peaceful ambiance. There are two primary types of deck heaters, both of which can be controlled remotely. Sitting deck heater - if you’re unable to or just not interested in hanging the heater above your deck, a sitting deck heater is a great solution. They come in many shapes and sizes and are highly effective. Hanging deck heater - similarly, hanging deck heaters are available in a range of makes and models but have the added benefit of not taking up any space on your deck. Much like our other heating system services, JW Brian Mechanical has extensive experience installing and servicing sitting and hanging deck heaters. 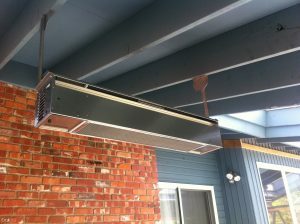 Please give us a call if you’re considering adding a deck heater to your home or business and would like our expertise.